Gupta Empire Rulers: The Gupta Empire was named after the Gupta dynasty which ruled approximately between 320- 550 CE. The Gupta dynasty period is regarded as the Golden Age of India since there was a lot of advancement in the field of science and technology, astronomy, art, literature, mathematics, etc. He was the founder of the Gupta Empire. Not much is known about the life of Sri Gupta, the founder of the vast and powerful empire. However, some information can be drawn from the writings of I- Tsing, a Chinese traveler. During the early years of dynasty’s reign, the empire was limited to the present day Bengal and some regions of Bihar. The capital of the Gupta Empire was Pataliputra. He was the son of Ghatotkacha and the grandson of Sri Gupta, the founder of the Gupta Empire. He succeeded Ghatotkacha and became the King of the Gupta Empire. The Gupta empire period is said to have begun from the time Chandragupta ascended the throne. He was one of the most powerful rulers of the Gupta Empire and it was under his rule that the empire expanded and became powerful. He is regarded as Maharajadhiraj, which literally means King of Kings. His marriage to Kumaradevi, the Lichchhavi princess further extended the boundaries of the Gupta Empire to the areas that were under the control of the Lichchhavi dynasty. He succeeded Chandragupta I. Samudragupta controlled the newly acquired territories by reinstating his enemies as tributary kings. This prevented the locals from rebelling against the invasion and thus helped maintain peace and order in the Empire. Almost immediately after ascending the throne he defeated Achyuta, the ruler of Ahichchhatra and Nagasena. Samudragupta dictated his supremacy over rulers of foreign states like Saka and Kushan. The supply of gold in the empire grew tremendously during his reign owing to a lot of conquests. He was also a celebrated poet and musician. Chandragupta II the Great succeeded Samudragupta. 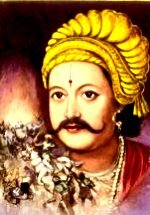 He was also known as Vikramaditya. He was one of the most powerful rulers of the Gupta Empire. It was during his reign that the empire was at its pinnacle. Chandragupta II is remembered for his epic victory over the last ruler of the Shaka-Kshatrapa dynasty, Rudrasimha III. After his victory, Chandragupta annexed their kingdom in Gujarat. During this period, the Vakataka kingdom was a part of the vast Gupta Empire. The boundaries of the empire in this period stretched from the mouth of the Ganges to the Indus River and from the present day Northern Pakistan to the mouth of river Narmada. At the time of the reign of Chandragupta II, Pataliputra was the capital and Ujjain was considered to be the second capital of the vast Gupta Empire. This period is termed as the Golden Age. The Nine Gems in the court of Chandragupta II were also popular, one of them being the great poet Kalidasa. Chandragupta II conquered areas under the control of the tribes and these included Parasikas, Huns, Kambojas, the Kinnaras, Kiratas, etc. Chandragupta II continued to issue gold coin types introduced by Samudragupta. These were Sceptre type, Archer type, and the Tiger type. He even introduced some new types of coins like the Horseman type and the Lion- slayer type, etc. He also issued silver coins and was the first of the Gupta rulers to do so. The purpose of issuing silver coins was to substitute them for the ones issued by the Kshatrapas. Chandragupta even issued lead and rare copper coins. Kumaragupta succeeded his father, Chandragupta II. He was also known as Mahendraditya. He was a capable leader who efficiently controlled and retained the territories of the vast Gupta Empire. At the time of his rule, the empire extended from Bengal to Kathiawar and from Himalaya to the Narmada. He was successful in defeating the rebels of the Pushyamitras and also eliminated the threat of invasion posed by the White Huns. Kumaragupta celebrated his success by performing horse sacrifice. He continued to issue the coins; Horseman type and the Lion slayer type. Kumaragupta I introduced new coins that had images of Lord Kartikeya. He was regarded as the last of the great Gupta rulers. As a ruler his biggest challenges were to face the Pushyamitras and the White Huns who were making repeated efforts to conquer the Gupta Empire. The attempts were also made to invade the empire during his father’s reign. He was successful in defeating the Pushyamitras, a tribe located in central India. The White Huns attempted to invade the Gupta Empire from the north-west. Skandagupta defeated the White Huns in 455. The coinage issued by Skandagupta was debased. He, however, issued different types of gold coins and silver coins. 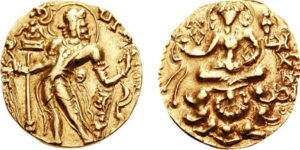 Skandagupta during his reign issued four types of gold coins. These were the Archer type, the King and Queen Type, Chhatra type and the Horseman type. The silver coins issued by him were also of four types namely, Garuda type, Bull type, Altar type, and the Madhyadesha type. Skandagupta changed the old dinar standard of coinage and introduced a new Suvarna standard. This became the standard weight of coinage during the reign of Skandagupta and was subsequently followed by his successors.